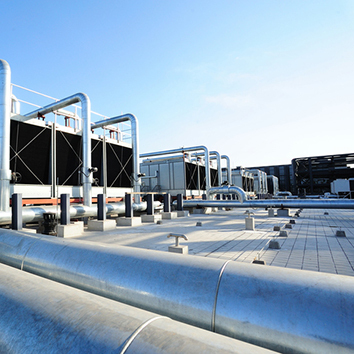 Maintenance of your cooling water system equipment is a massive job. Problems like scale, debris, and algae are a constant threat, always waiting to make their way into your system. And if these contaminants are allowed to set up shop, they can quickly compromise the performance and efficiency of your entire cooling water system. This can lead to increases in cooling costs and, even worse, premature equipment failure that could cost thousands. Fortunately, keeping your cooling water system clean and maintained is the easiest way to avoid unexpected — and often dramatic — costs of replacing cooling water systems equipment early. This seems fairly simple. What’s not simple, however, is knowing when, why, and how to clean each component. The key is finding a balance between regular maintenance and cleaning and not spending more than you need to get this done. If you know your cooling water system’s working parts and biggest enemies, you’ll be able to develop a plan to keep your cooling system running smoothly without unnecessary expenses. Here are 9 cooling water system components and a tip to extend the life of each. Clean it regularly to keep it free from scale, rust chips from mill scale, and debris from the outside like cottonwood. These things interfere with water flow through the nozzles and lead to inadequate chemical treatment levels. Keep the fill area free of scale, rust chips, debris, and cottonwood. Proper airflow is needed for heat transfer and the lowest energy usage. Make sure the pump materials are compatible with the chemicals you use, or the equipment will fail. Have pumps regularly inspected and serviced to maintain the proper flow rate. Flow loops need to be regularly cleaned and checked for plugging from scale, rust chips, and other debris. Install strainers to keep them clean and pay careful attention to the smaller 3/4″ loops that are used to measure system health. If they become plugged, the live readings for chemistry adjustments will not work properly, leading to overuse of chemicals, improperly treated water, and higher costs. Pay special attention to the narrow openings that are prone to debris buildup. When these are clogged, the measure of water load will be inaccurate, leading to improper chemical dosing. Regularly clean and service the probes, or replace them once a year if they are low-end probes. Check if yours has replaceable electrode solution and salt bridges. Replacing these components often means you don’t have to replace the whole probe. The narrow passageway that creates heat exchange from the heat rejection loop to the process loop is very prone to clogging. Keep it free from scale, rust chips, debris, and cottonwood because a clog is difficult and costly to clean. Watch your sensors for buildup of scale, cottonwood, and other debris. If they are not kept clean, they will give you an unreliable reading of your chemical treatment levels. Regularly remove debris like rust chips and cottonwood. Without proper blowdown, scale can build up and interfere with cycles of concentration in the cooling water system. A cooling water system that isn’t cleaned and maintained properly can lead to costly and stressful repairs and replacement of equipment. You can avoid these issues — and many others like dangerous bacteria contamination — if you stay on top of each of these parts and what they need to operate properly. Wondering where to start? A fully staffed, skilled water management team is your weapon against dirty equipment and premature failure of your cooling water systems. Learn how to put your team together by downloading this spreadsheet that tells you exactly who you need — and what they need to do.